Very interesting and real way of getting ice from the liquid. Right before your eyes within seconds the liquid turns into ice. With this trick you can amaze your friends and acquaintances. Sodium acetate can you buy in a shop that sells chemicals and reagents. But it is also possible to obtain in the home. For this we need vinegar essence and baking soda. Mix soda with vinegar and wait until, until will not stop the reaction (until no bubbles stand out). Then this mixture should be evaporated and cool. Should be a solid piece (the remaining liquid to drain) is turned crystalline sodium acetate, which you need to use immediately. Put a bowl of water on fire and bring to boiling point (but do not allow to bubble). 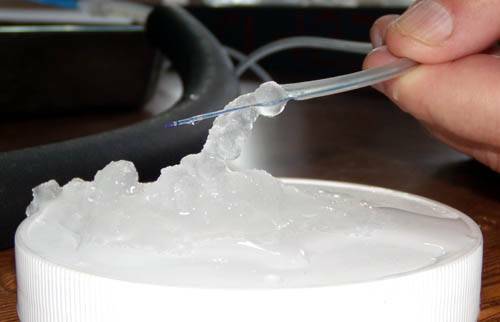 Add water to the sodium acetate and stir until then, until it ceases to dissolve. Carefully pour in a glass or in a bowl of water mixed with the sodium acetate (precipitate pour is not necessary) and put into the refrigerator. After cooling you'll have liquid ice. Upon contact with any object, whether a finger or the fallen crumbs, the liquid will instantly turn into ice. Can make liquid ice in a different way. Put distilled water in the freezer to freeze overnight. Keep in mind that it does not freeze and remains in liquid state. But if this water is poured into another container, it will instantly freeze.